Adelaide - South Africa coach Gary Kirsten defended his team's preparations after his pace brigade was laid low by injury in the second Test on Thursday, leaving his back-up bowlers at the mercy of a voracious Michael Clarke and the Australian batsmen. South Africa lost paceman Vernon Philander to a back strain prior to the match, and suffered a hammer blow after Jacques Kallis went off with a hamstring injury after capturing two wickets before lunch. Dale Steyn returned to the field after taking himself off after tea to be treated for a leg strain but the tourists finished the day bruised and demoralised as Australia racked up a mammoth first-day total of 482-5 at the Adelaide Oval. The team went fishing during a four-day layoff after the drawn first Test in Brisbane before training for four days in the lead-up to the second and Kirsten said that was enough preparation for his bowlers. "First of all, we had four great days of prep leading into this game but it's always a thing that will come up. "Often when we're home for a Test series we send players home and they come back two days ahead to prepare. "There's no exact science to it. You can always find a way to criticise in some department. "Every team goes through injuries at some point in time. I don't think we're unique to that. The fact that it happened on one day, I certainly don't have the answers to that. It was unfortunate." Steyn, who captured the last wicket of the day by bowling Hussey for 103, was not badly injured, Kirsten said, but Philander's availability for the third and final Test in Perth remained a doubt, while Kallis will not bowl for the remainder of the Test, but could be fit to bat. "We'll have to wait for that. He's a little bit sore," Kirsten said. "He made a wise decision. As soon as he felt a twinge he got off the park quickly. "Obviously from a batting perspective it's going to be important - these days we don't have runners, so it's going to be important that he can bat for us as well." In their absence, spinner Imran Tahir was flayed for 159 runs, while Philander's replacement Rory Kleinveldt also went wicketless for 70. Morne Morkel, with little support, captured two wickets but was pillaged for nearly six runs an over in conceding 128. "I think it was a difficult first-innings wicket for a spinner to bowl on, especially when you've got someone like Michael Clarke who is going to pounce," Kirsten said, referring to the Australian captain's 224 not out, following his unbeaten 259 in Brisbane. "I don't think we bowled well enough throughout the day to really put enough pressure on the batsmen at any time. 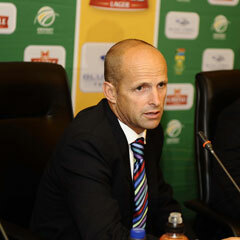 "I don't think I could ever fault the attitude of my players, the Proteas. I would never fault the intensity that they do things. "I know they're giving everything they've got. Maybe where we're at fault is our thinking. We try and deal with that as much as we can."